I just love little girl stuff–cute Sunday dresses, lovely butterfly decor, adorable flower headbands. Every time we are at the store, I longingly look at these things and sigh. My husband just laughs and says, “Maybe our next kiddo will be a girl.” Don’t get me wrong; I love my little man and wouldn’t trade him for anything, (balls, trucks, and all!) but there’s just something about little girl stuff that makes you all warm and fuzzy inside and feel that all is right with the world. That’s how I felt when I saw this scrapbook paper at my craft store. It’s fun, whimsical, full of bright colors, and has glitter. Anything with glitter is one of my favorites. 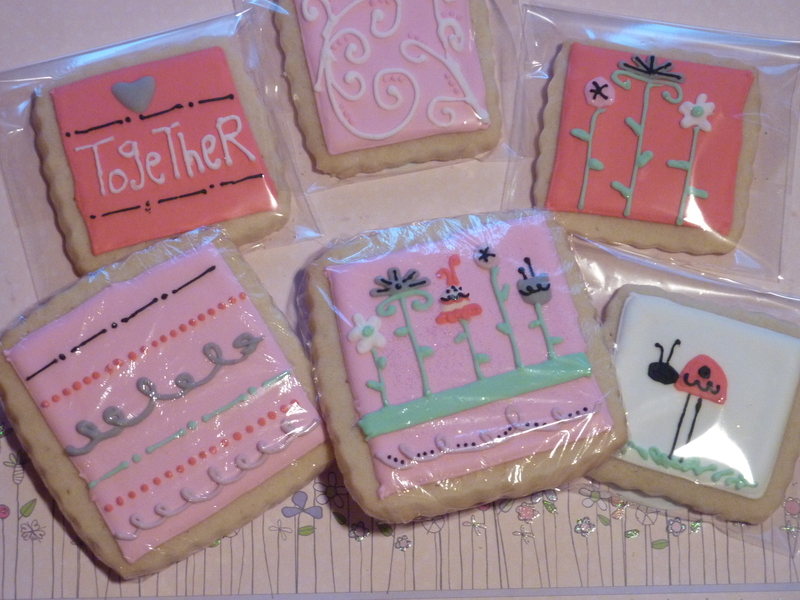 The paper inspired me to decorate some sugar cookies; and maybe someday, to scrapbook a page or two for a little girl–my little girl. I made these sugar cookies about two months ago, when the weather was cold, the lure of Christmas was over, and Valentine’s had not yet arrived. I brought them into my work so Eric and I didn’t eat them all. Plus, it was the end of the semester, and sugar goodies always help teachers get through grading those last essays and tests. These are whimsical flowers, using two square sizes. Other than the ladybug, I don’t know what you’d call these–swirly? I had a close-up picture, but for some reason we couldn’t figure out how to get it to focus at such a short range. Guess it’s time to read the instruction manual. Here’s me packaging and labeling before work. There’s Nico the fat cat, behind me, trying to go outside. Haha, what a goofball! Your cookies are adorable. You are so talented.